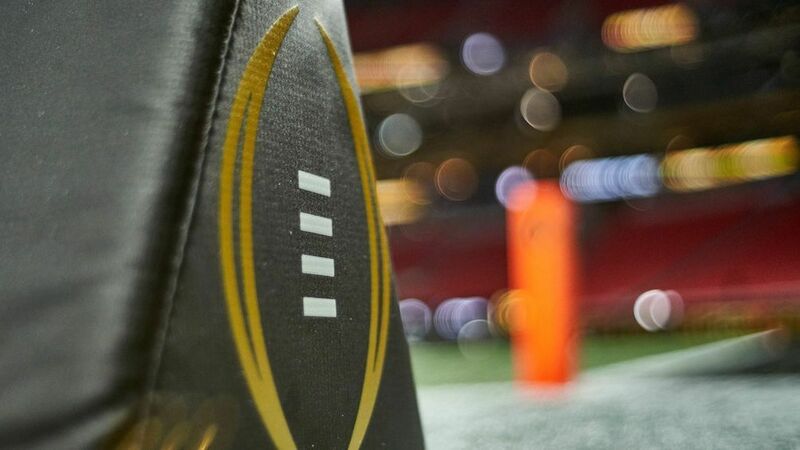 It took four weeks of College Football Playoff rankings, but for the first time this season, there were no big surprises from the selection committee. With only one Top 10 team (No. 5 Louisville) losing last week, the only noteworthy change in the top half of the rankings was the Cardinals dropping to No. 11 and the former Nos. 6-11 teams each sliding up one spot. In the positions that matter, though, it's still No. 1 Alabama, No. 2 Ohio State, No. 3 Michigan and No. 4 Clemson. Despite much arguing from ESPN's Joey Galloway, Danny Kanell, David Pollack and Kirk Herbstreit, USC remains well outside of striking distance at No. 12. As you'll see shortly, we don't even have the Trojans projected for a New Year's Six game. Why is everyone so fired up that the highest-ranked three-loss team isn't ranked even higher? Elsewhere in the Top 25, two AAC teams replaced two SEC teams (LSU and Texas A&M) as No. 20 Houston and No. 25 Navy are now officially challenging No. 19 Boise State and No. 21 Western Michigan for the Group of Five's spot in the Cotton Bowl. One curious decision was Washington State only dropping one spot to No. 23 for losing by two touchdowns to Colorado. If you're of the conspiracy-theory persuasion, that sure is an interesting way to try to drum up viewership for Friday night's Apple Cup. Now that we know what the Top Four currently looks like, let's take a look into the crystal ball to figure out which teams will actually be battling for the national championship on New Year's Eve. While we're there, let's also project each and every one of the 40 bowl games. No changes from last week, unless you count Louisville and West Virginia dropping from "highly unlikely" to "effectively eliminated" after their blowout losses to Houston and Oklahoma, respectively. Alabama is so clearly No. 1, people have stopped talking about the Crimson Tide. Unless they lose to Auburn this weekend and lose to Florida in the SEC Championship Game, it's hard to imagine this team finishing anywhere other than No. 1 in the CFP rankings. We're still projecting Clemson as the No. 2 team because of its sheer number of quality wins and its projected conference championship. If the Tigers can take care of business against South Carolina this weekend before beating either Virginia Tech or North Carolina in the ACC title game, they would have nine wins over currently bowl-eligible teams with a chance for that number to jump to 11 if Boston College and N.C. State sneak in. There aren't many great wins in the bunch, but there are enough good ones to get the job done. Ohio State remains No. 3 after barely eking out a 17-16 win over Michigan State. The Buckeyes finish the regular season with the big game against Michigan for a chance to add the Wolverines to a wall of scalps that already includes Oklahoma, Wisconsin and Nebraska. The Buckeyes would still need help in the form of a Penn State loss to Michigan State in order to reach the Big Ten Championship Game, but they likely wouldn't need a conference championship in order to stay in the top four. And the last spot is now a four-horse race between Wisconsin, Penn State, Washington and Oklahoma. If it's the Badgers against the Nittany Lions for the Big Ten Championship, it would be tough to ignore the team that wins the best conference in the nation this year, even though they both already have two losses. Their toughest competition is the Huskies, which, to remain in the picture, would pick up wins over Washington State and Colorado to get to 12-1. Would it be enough, though, with nonconference wins over Idaho, Rutgers and Portland State? Similarly, could Oklahoma possibly sneak in after going 1-2 in nonconference play with a win over Louisiana-Monroe and losses to Houston and Ohio State? Chances are strong that the Big Ten is going to get two teams into the national semifinals, unless Michigan beats Ohio State this Saturday before also beating Wisconsin to win the conference title. At that point, both the Pac-12 and Big 12 champs would look better than the second-best resume the Big Ten has to offer. Not much changed in this section, either. The Orange, Rose and Cotton Bowl projections all remain the same from one week ago, even though Louisville suffered a loss, as there isn't another ACC team more deserving of that spot unless Virginia Tech upsets Clemson in the conference championship game. The Sugar Bowl, though, has two new teams. It was LSU and West Virginia last Tuesday, but Florida and Oklahoma jump into those spots after Week 12 road wins over those foes. Per usual, the most intriguing/challenging placement of the week remains the second participant in the Cotton Bowl. There's only so much we can do with the other ones because of their conference tie-ins, but that Cotton Bowl spot is an at-large free-for-all. Assuming Alabama, Clemson, Wisconsin and Washington win the four major-conference championships and ruling out the other 11 teams already assigned elsewhere, there aren't any great options remaining. West Virginia and Nebraska are the only potentially two-loss, Power Five teams in the mix, but neither one has any marquee wins this season. There aren't any other candidates from the Big Ten or Big 12. After Clemson and Louisville, the ACC's only viable option is Florida State, but the Seminoles need to beat Florida this Saturday before they can be seriously considered. Even at that, they would be a stretch. That leaves the second-best Pac-12 team and the third-best SEC team as the pool of candidates, from which we're taking Colorado. A lot of people are in love with USC right now, but it's possible the Trojans will enter the postseason with only two wins over bowl teams. They look incredible on the field, but that resume isn't going to cut it if Colorado beats Utah to keep the Trojans from even playing in the Pac-12 title game. The quest for 80 six-win teams is growing more unlikely every week. There are currently 65 bowl-eligible teams with 19 more that could potentially still get to six wins. Given the game (or two games, in some cases) still remaining to be played, though, we wouldn't bet on 15 of those 19 teams getting the job done. This means there's a good chance that multiple 5-7 teams end up with bowl invites. Who ultimately gets in and who gets left out? Northwestern (vs. Illinois), Indiana (vs. Purdue), Maryland (vs. Rutgers), Hawaii (vs. Massachusetts), Miami Ohio (vs. Ball State), Ole Miss (vs. Mississippi State), Texas-San Antonio (vs. Charlotte) and South Alabama (vs. New Mexico State) each has five wins with a home game remaining in which it should be heavily favored. At least one of them will inevitably blow it, but that ought to get us to 73 teams. We're also guaranteed one more bowl team when 5-6 Texas hosts 5-5 TCU, with the reasonable possibility TCU loses that game before winning at home against Kansas State next week so both teams get to six victories. That would be 75 teams with Arizona State (at Arizona) and North Texas (at UTEP) both playing toss-up games. Even if the Sun Devils and Mean Green both win, while all of the aforementioned home favorites win AND that TCU and Texas scenario goes as well as it possibly can, that still leaves three spots to go. Vanderbilt, Boston College, North Carolina State, Southern Miss, Akron and SMU each has five wins and a tough game remaining. Should they each lose—and if 4-6 Louisiana-Lafayette loses one of its two remaining games against Arkansas State and Louisiana-Monroe—that means three 5-7 teams, at which point APR scores become the deciding factor. Though Vanderbilt (990 APR) and Boston College (981 APR) both figure to lose this week, they will likely have the two highest APR scores among the 5-7 teams. And unless Duke (995 APR; at Miami), Notre Dame (975 APR; at USC) or Syracuse (973 APR; at Pitt) can win games in which Vegas has them each getting multiple touchdowns, the 80th spot figures to come down to a battle between 4-7 Pac-12 schools: UCLA and Oregon. Neither the Bruins (at California) nor the Ducks (at Oregon State) will be heavy favorites Saturday, but both should win, leaving UCLA with the right of first refusal because its APR score (972) is better than Oregon's (969). Should UCLA lose and Oregon win, N.C. State would also be in the conversation with a 5-7 record and a 969 APR score, but it's hard to imagine any bowl committee choosing the Wolfpack over the Ducks. The moral of the story is that the regular season is all but over, yet we still have no idea who the final six or so bowl teams will be. There are half a dozen marquee games between ranked teams this week, but keep an eye on battles like SMU vs. Navy and Southern Miss vs. Louisiana Tech to get a feel for how many teams will actually earn their trip to a bowl game.